I wasn’t very interested in Twilight when I first heard about it, as neither Mormon abstinence propaganda nor teen romance are really my thing. But then it occurred to me it was also about surliness, militant virginity, and the nonhuman: that is, Shulamith Firestone, Andrea Dworkin, and Donna Harraway; so I thought I ought to watch it. Turns out, it’s a pretty decent film. It’s genuinely witty, with a funny running gag about how Washington is a great place for vampires because it’s always overcast, and a nicely balanced awareness of how the vampire mythology feeds into a certain kind of adolescent self-dramatization (this is the same self-aware embrace of adolescent ridiculousness that makes up what I like about The Smiths). The most interesting thing about the film, though, is the way Kristen Stewart portrays Bella as out of step with the whole world, as someone whose ontological condition is discomfort. We see early on in the film that Bella is uncomfortable in her body; she’s clumsy and, she repeatedly insists, she can’t dance. And throughout the film, Bella’s inarticulateness, verging on aphasia, is remarkable; she only completes a handful of sentences (indeed, I think, only a handful of coherent phrases) in the whole film. If the human being is an animal having speech, Bella is excluded from humanity, neither (embodied) animal nor speaking being. But while the film is showing us this exclusion, it is also positioning Bella as the human between two poles of inhumanity, Jacob and Edward. The way in which Jacob, the werewolf, represents animalistic embodiment is fairly clear, while for the vampire Edward his incredible strength and speed mean that the world presents no physical barriers, while his ability to read minds means that there are no communicative barriers either; Edward is disembodied, immersed in the communicability of language without remainder (I think Benladen’s theses on TI, disembodiment and capitalism might be relevant here). 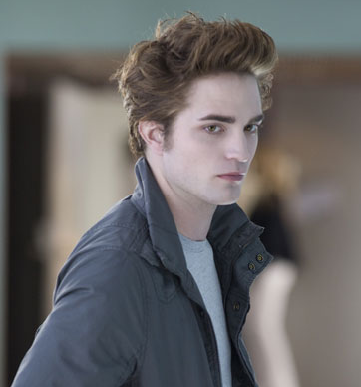 For Edward, this complete at-homeness in the world makes him a monster, and the make-up and direction do indeed do a good job of rendering Robert Pattinson, pallid and looming, monstrous. This is incomprehensible to Bella,who sees in this “monstrosity” the end of her disconnection from her own humanity. (The title of, and the inspiration for, this post comes from X-Ray Spex’s “I Can’t Do Anything”). ← Are the liberal arts free enough?